By raising prices and keeping key features out of Office 2019, Microsoft is telegraphing its desire to move its entire user base to Office 365. When Microsoft released Office 2019 for Windows this fall, it did so not with a bang, but a whisper. In years gone by, Microsoft typically trumpeted new Office releases with great fanfare and hoopla, but this time it released a blog post or two with few details and left it at that. There’s good reason for that: Microsoft is pushing Office 365, the subscription of version of Office, over the perpetual version of the suite. When you purchase a perpetual version of Office, such as Office 2016 or Office 2019, you pay a one-time fee for it and own it forever — and it never gets new features. That’s in contrast to Office 365, which requires an ongoing subscription fee and is constantly updated with new features. It’s clear that Microsoft wants people to move to Office 365, so it wants to draw as little attention as possible to any new perpetual Office release. There’s another reason that Microsoft whispered. It used to be that whenever Microsoft released Office with a new version number — for example, Office 2016 — that version was more powerful than any other available. That’s no longer the case. Office 2019 is considerably less powerful than Office 365. There’s nothing new in Office 2019 that hasn’t already been available for quite some time to millions of Office 365 subscribers (the company says it has more than 31 million subscribers to consumer editions), and in fact, Microsoft left several features out of Office 2019 that it had introduced in Office 365 over the past few years. So the company had nothing new to wow the world with when talking about Office 2019. So what’s new in Office 2019? And which is better for you or your organization, Office 2019 or Office 365? To help you decide, we’ve taken a look at Office 2019’s most important new features below, and then compared it to Office 365. One final note about Office 2019 before we get into the nitty-gritty: Unlike previous releases of the perpetual version of Office, it will run only on Windows 10. There will still, however, be both 32-bit and 64-bit versions of it. There are a few nice tidbits for Excel users in Office 2019, but don’t expect anything dramatic. Excel’s new features focus primarily on data analysis, including funnel charts and 2D maps, new functions and connectors, the ability to publish from Excel to PowerBI, and enhancements to PowerPivot and PowerQuery. Funnel charts are useful when you want to display values at multiple stages in a process. A funnel chart can show the number of sales prospects at every stage of a sales process, for example, with prospects at the top for the first stage, qualified prospects underneath it for the second stage, and so on, until you get to the final stage, closed sales. Generally, the values in funnel charts decrease with each stage, so the bars in the chart look like a funnel. Overall they’re a nice-to-have addition to Excel. Map charts are useful as well, and probably have wider applicability for most people. They let you compare data across different geographical regions, such as countries, regions, states, counties or postal codes. Among the functions added to Excel are TEXTJOIN and CONCAT, which let you combine text strings from ranges of cells with or without using a delimiter separating each item, such as a comma. You only need to refer to the range and specify a delimiter, and Excel does the rest. Two other functions added are the IFS and SWITCH functions, which help specify a series of conditions, for example, when using nested IF functions. And two more, MAXIFS and MINIFS, make it easier to filter and calculate data in a number of different ways. Get more details about them all from Microsoft. The upshot for Excel 2019: Nice new additions. Too bad there aren’t more of them. The only significant new feature Word gets in Office 2019 is the Translator pane, useful for those who need to work in multiple languages. To translate words or phrases with it, you select them, then right-click your selection and choose Translate from the menu that appears. 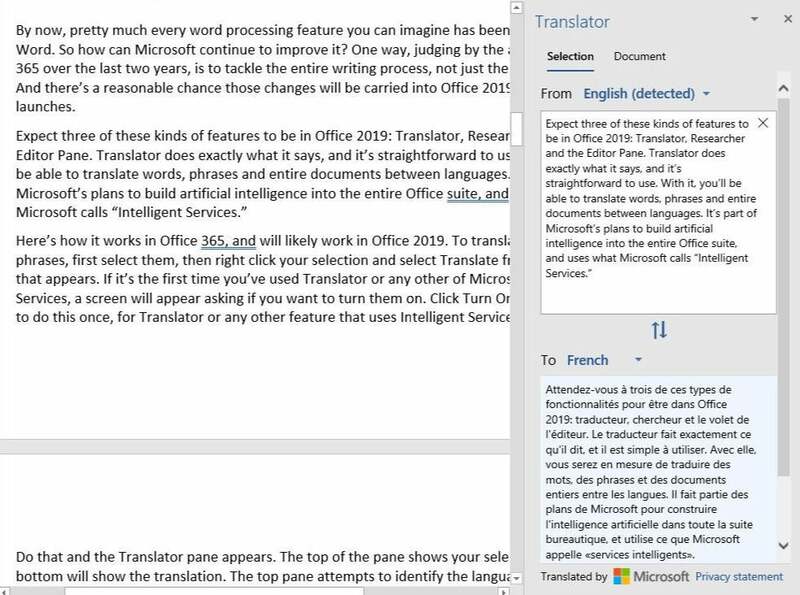 Note that Translator is part of what Microsoft calls Intelligent Services, the artificial intelligence behind such Office features as Smart Lookup and Researcher. If it’s the first time you’ve used one of these AI-driven features, a screen appears asking if you want to turn Intelligent Services on. Click Turn On. That happens once. You won’t have to do it again. After that, the Translator pane appears. The top of the pane shows your selection, and the bottom shows the translation. The top pane attempts to identify the original language. For me, it’s worked correctly every time. If it does misidentify the language, though, just select the right language. After that, in the bottom of the pane select the language you want to translate to. The translation appears. To insert it somewhere into the document, move your cursor to the spot where you want it to appear, and click Insert at the bottom of the pane. You can also copy and paste any part of the translation into the document or another document. Word 2019’s Translator feature in action. To translate an entire document, go to the Ribbon and select Review > Translate > Translate document. The Translator pane appears. Select the document’s language, then the language you want to translate it to, and click the Translate button. The translated document opens in a new Word window, which you can then save or copy portions of. Translator is also available in PowerPoint and Excel 2019 for translating selected words or phrases, but you can’t use it to translate whole files in those apps. Beyond the Translator pane, there are a few other small additions to Word 2019, including a black theme, speech-to-text capabilities and accessibility improvements. But the changes are generally slim pickings. You’ll likely be disappointed in how little new you get in Word 2019. The most important of PowerPoint 2019’s new features are Morph and Zoom. Morph is a simple-to-use tool that makes it easy to create animated transitions between slides. That solves a long-term, nagging PowerPoint problem: Its Animations tab, while packed with plenty of power, is tough to use. And creating animations with it can be quite time-consuming. Morph lets you show motion in transitions and inside slides, but without having to resort to using the Animations tab. To do it, you duplicate an existing slide, and then make changes to the duplicate slide, such as shrinking an element or elements in it, growing them, moving them to new locations or rotating them. Then when you apply Morph to the slide, PowerPoint automatically creates an animated transition between the slides. Onscreen, they look like a single slide morphing, hence the feature’s name. 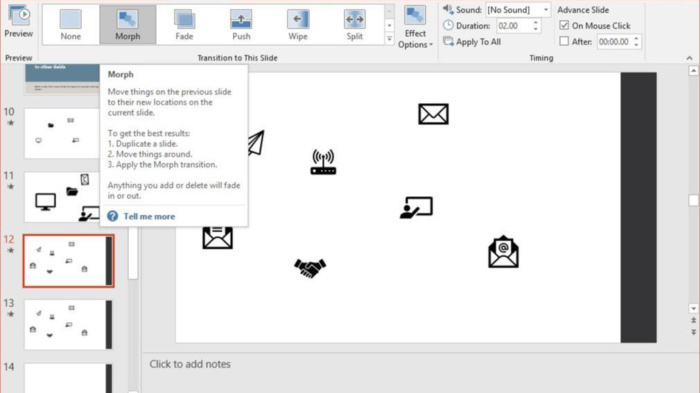 Morph is a simple way to create animations in PowerPoint 2019. Zoom creates a kind of visual table of contents for your presentation that lets you quickly zoom from one section to another. When you’re in a presentation, select Insert > Zoom, then choose the slides you want displayed in the “Zoom” slide. A new slide is created with thumbnails of those slides. When giving a presentation, you’ll be able to jump to any slide instantly by clicking its thumbnail. Most everyone who creates presentations will find Morph and Zoom useful. Because of them, PowerPoint is the Office application most improved in Office 2019. The only significant change to Outlook 2019 is what Microsoft calls the Focused Inbox. It’s designed to deal with the email overload most of us put up with every day — the frustrating mix of newsletters you don’t recall signing up for, retail come-ons, pointless messages, important messages and so on. Focused inbox uses artificial intelligence to figure out which messages are most important to you and puts them into a Focused tab. The rest get put into an Other tab. You can manually move messages from one folder to the other and tell Focused Inbox to automatically filter them in that way in the future. To turn on Focused Inbox, select the View tab from the Ribbon, then click the “Show Focused Inbox” icon. From now on, you’ll have two tabs in your Inbox, Focused and Other. The Focused tab should have the most important messages, and the Other tab should have less-important messages. Turning on Focused Inbox in Outlook 2019. Although Focused Inbox isn’t an earthshaking change, I’ve found that it makes handling email moderately more easy. So Outlook users have something to be pleased about in Office 2019. For more details, head to the Office 2019 Click-to-Run FAQ. For those trying to decide between Office 2019 and Office 365, what’s not in Office 2019 but is in Office 365 is what’s really important. And there’s plenty that Office 365 gives you that Office 2019 doesn’t. In fact, there’s so much that I’ll only cover the more important features here. You won’t be able to collaborate with others in real time in Excel 2019, as you can in Excel for Office 365, which is a serious drawback for anyone who works with others. Word 2019 doesn’t have the Researcher pane that is available in Office 365 that lets you easily do research via the internet directly from Word. It doesn’t have the full Editor pane of editing tools, either. Although neither of these is a must-have, they can cut down the time it takes to create and edit documents. PowerPoint 2019 doesn’t include either Designer or QuickStarter. Designer suggests new slide designs for you as you create a presentation, based on graphics you add to slides. And QuickStarter jump-starts your presentation by helping you with research and outline creation. These are big, important features that are real losses for anyone who spends much time creating presentations. And none of the Office 2019 apps offers the extremely useful AutoSave feature available in Office 365; it makes sure you don’t lose the latest edits to your files and lets you examine, use and revert to older versions of your files. Office 365 also has a redesigned Ribbon that Office 2019 users don’t get. The new Ribbon is streamlined and stripped-down, and is simpler and easier to use than the one in Office 2019. Just as important as all this is the fact that Office 365 subscribers constantly get new features, while Office 2019 is frozen in time. What you see today is what you get forever, because it never gets updated with new features. (It does, however, get security updates.) If you want new features and don’t want an Office 365 subscription, you’ll have to wait for the next perpetual version of Office and buy that — and even then it won’t include all the features in Office 365. Another major difference between Office 2019 and Office 365 is their cost and how many copies of the Office suite you get when you buy them. When you buy Office 2019, you can run that one copy on a single computer for a single person. The Home & Student version costs $150 and includes Word, Excel, PowerPoint and OneNote for Windows 10. At $250, the Home & Business version includes all that plus Outlook. The $440 Professional version has all that Home & Business offers plus Publisher and Access (for Windows only). Enterprise options include Office Standard 2019, which includes Word, Excel, PowerPoint, Outlook, and Publisher, and Office Professional Plus 2019, which includes all that plus Access and Skype for Business; pricing depends on volume. As for pricing for Office 365, the Office 365 Home version includes Word, Excel, PowerPoint, Outlook, and OneNote; costs $100 a year; and can be used by up to six different people and installed on an unlimited number of devices. Each person gets 1TB OneDrive cloud storage and can be signed into five devices simultaneously. Office 365 Personal includes Word, Excel, PowerPoint, Outlook, OneNote, and OneDrive (with 1TB storage), plus Publisher and Access (for Windows only). It costs $70 a year and can be installed on an unlimited number of devices, although only for a single user. Beyond that, if you want to use Office on smartphones and tablets, Office 2019 gives you apps with only basic editing features, while Office 365 offers mobile apps with more advanced tools such as tracking and reviewing changes and features such as WordArt, Morph for PowerPoint, customized PivotTables for Excel, and much more. If it seems that you get far more value with Office 365 than you do with Office 2019, that’s not accidental. It’s clear that Microsoft would like to kill the perpetual version of Office, but enough people and businesses still want it that there’s no practical way for Microsoft to do it in. Why do people still want the perpetual version? Many are uncomfortable with the idea of having to pay a smaller amount every year to keep using Office; they’d rather plunk down a larger sum once and own the suite outright. And some businesses are unwilling or unable to move to a cloud-based platform. If you’re not convinced Microsoft is pushing people away from Office 2019 and towards Office 365, consider this: Microsoft recently increased prices for both commercial and retail versions of Office 2019 by as much as 10%, depending on the version. Around the same time, Microsoft announced that it would allow consumer versions of Office 365 to be installed on an unlimited number of devices. Between the stick of higher prices for the perpetual versions and the carrot of unlimited devices with a subscription, Microsoft is doing whatever it can to move everyone to Office 365. So should you choose Office 2019 or Office 365? For most individuals, the answer is simple: Choose Office 365. You get the latest features today and into the future, lots of free storage and the ability to use Office apps on an unlimited number of machines. For families, Office 365 Home makes the best sense, since it allows up to six users for $30 per year more than the Personal plan. From my point of view, the choice is as close to a no-brainer as it gets. Who should buy Office 2019? Only someone who has only a single computer and expects never to get a second one, wants only the most basic Office features, and doesn’t care about additional storage or using advanced features on mobile devices. As for businesses, Office 2019 is best for organizations that don’t have constant access to the cloud or aren’t yet willing to go full-bore to software that works so closely with cloud access. Otherwise, Office 365 makes more sense for most. Office 2019 is an underwhelming version of the Office suite, but that’s not a failure on Microsoft’s part; the company has created it that way on purpose. Microsoft doesn’t feel it can offend the shrinking user base for the perpetual version of Office by simply killing it off. So while the company continues to lavish new features on Office 365, it left most of them out of Office 2019, which Microsoft hopes will be so unappealing that few people will buy it. Odds are you’ll be one of the many who eschew it in favor of an Office 365 subscription.